Yesterday I saw Darkest Hour, the latest in a welcome—to me—spate of Winston Churchill films. Those who complained of Dunkirk's crucial lack of generals pushing flags around map tables have the movie they wanted in Darkest Hour—this film takes place almost entirely in smoky conference rooms and halls of power. That's not a criticism—there should be room for both kinds of movies. But Darkest Hour is much, much more than a recreation of grand strategy and the decisions of powerful men. It's an excellent dramatization of determination in the face of defeat and the crucial role one man can play. 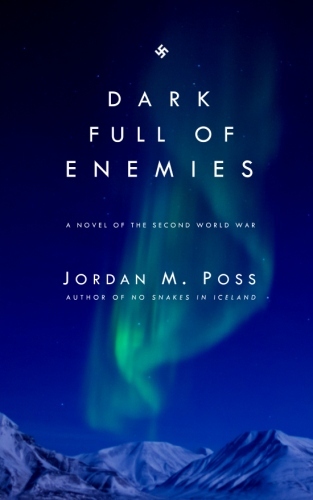 When Darkest Hour begins in May 1940, Nazi Germany, flush with diplomatic victory in Czechoslovakia (1938) and military conquest in Poland (1939), Denmark, and Norway (April 1940), has invaded France. Prime Minister Neville Chamberlain, once lauded as the savior of world peace, is now derided and mocked to his face in Parliament. Chamberlain recognizes that he must step down, and that political and military necessity require the formation of a coalition government between rival parties. Chamberlain nominates Lord Halifax as his successor, but it rapidly becomes clear—to the immense exasperation of Chamberlain, Halifax, and King George VI—that the only member of their party that the opposition will accept as head of a coalition is Winston Churchill. 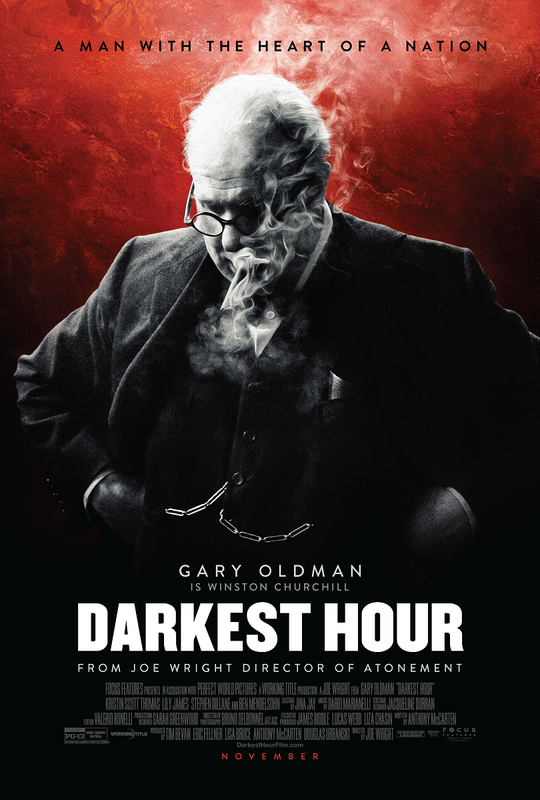 Darkest Hour follows Churchill—65 years old, outspoken political pariah and flipflopper, veteran of many failed imperial and military ventures, the most prominent of which is the Gallipoli campaign—through roughly the first month of his premiership, into but not quite through the crisis at Dunkirk, which plays out, off-screen, through the last third or so of the film. Throughout, Churchill must battle rivals within his own government, especially Chamberlain and Halifax, who want to pursue negotiations with Germany in order to avoid further bloodshed and the total destruction of the British army in France. The performances throughout are excellent. 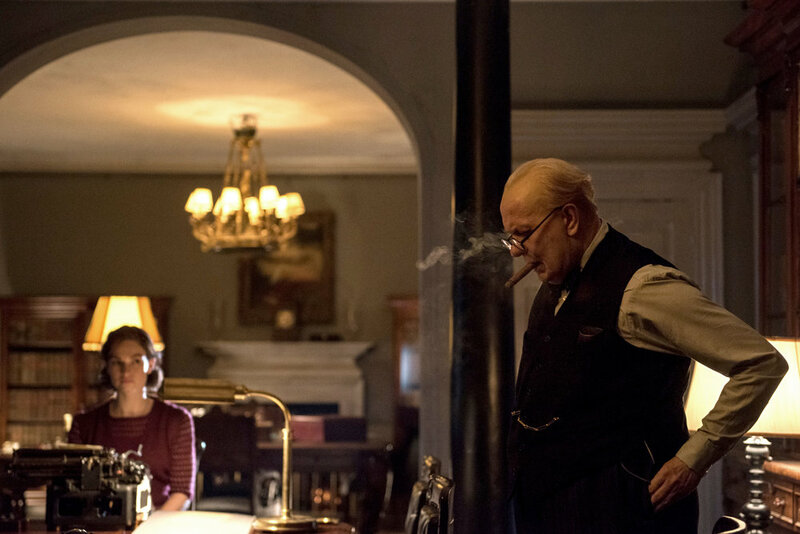 Gary Oldman, in heavy prosthetics and a fat suit, is very good as Churchill. His voice never quite loses that familiar Gary Oldman timbre, and he sounds whinier than Churchill when reaching into the upper registers, but he captures a great deal of the spirit and especially the energy of the man—the real man, not the icon. Oldman ably walks the line between caricature and character assassination, about which more below. Other standouts include Stephen Dillane (Thomas Jefferson in HBO's John Adams) as Lord Halifax, depicted here as perhaps oilier and more conniving than in real life but a powerful opponent to what Halifax perceives as Churchill's recklessness with the lives of British soldiers and civilians. Ronald Pickup is good as a politically disgraced and physically failing Chamberlain. Kristin Scott Thomas is good as Clemmie Churchill and Ben Mendelsohn is good as a standoffish George VI who must warm up to Churchill over the course of the film. Lily James brings the luminous innocence of her characters from Downtown Abbey, Cinderella, and Baby Driver to the small—probably too small—part of Elizabeth Layton, Churchill's new secretary. Crucially, all of these performers work well together, and especially with Oldman, who is willing to share his scenes with other characters rather than grandstand. The film is beautifully scored by Dario Marianelli, and beautifully shot by Bruno Delbonnel. Especially stunning are scenes set in Parliament or Churchill's underground war cabinet. A radio broadcast lit by the red On Air bulb is particularly striking. The cinematography has a digital sheen that I don't care for, but digital cinematography is in the ascendant; you won't see many more Dunkirks going forward. A brief word about the film's historical accuracy, something I've mentioned before that I care a lot about. Darkest Hour depicts an intensely busy and chaotic month in one of the most dramatic events of world history. Naturally, the screenwriter and filmmakers have massaged the material to fit within a two-hour runtime. Characterizations are mostly accurate, and the events themselves are largely true to the historical record. I was underwhelmed by the famous and apparently controversial scene in which Churchill travels one stop on the tube and talks to ordinary Londoners. One reviewer, who apparently didn't pay much attention to the movie, claims that Darkest Hour "dishonors Winston Churchill's memory." The tube scene is charming and sentimental—and extremely restrained compared to the sentiment in historical films by Steven Spielberg—but hardly dishonors the man. Oldman, in an interview linked below, described it as "lyrical," a poetic scene that aims at "emotional truth" rather than literal, events-based drama. I'm fine with that. Like those of another great World War II film, Valkyrie, the events of Darkest Hour are well known. What the film succeeds at brilliantly is portraying the doubt and fear of living through those events ignorant of the outcome. That's always a worthy achievement. But the film Darkest Hour reminded me most of was Lincoln, with its dramatic depiction of how ideals and determination must force their way through the realities of political life: compromise, cooperation, wooing, and sometimes abject failure. Like Lincoln, Darkest Hour is held together by a great central performance. 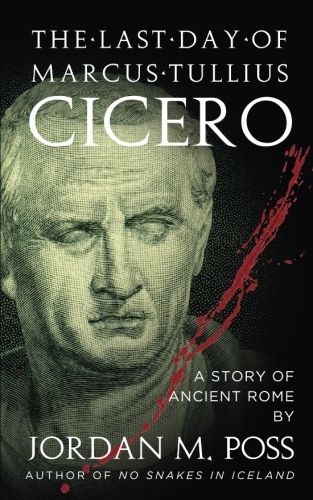 And through those perfomances both films show us leaders who can accurately parse what is and is not important, which hills to evacuate and which to die on, and, rather than succumbing to defeat or cynicism or mere jockeying for power, see the big picture and drive toward it. And there are surely more. Oldman is a powerhouse in Darkest Hour, but as I've hinted above, I never quite overcame my sense that I was watching a really good performance. 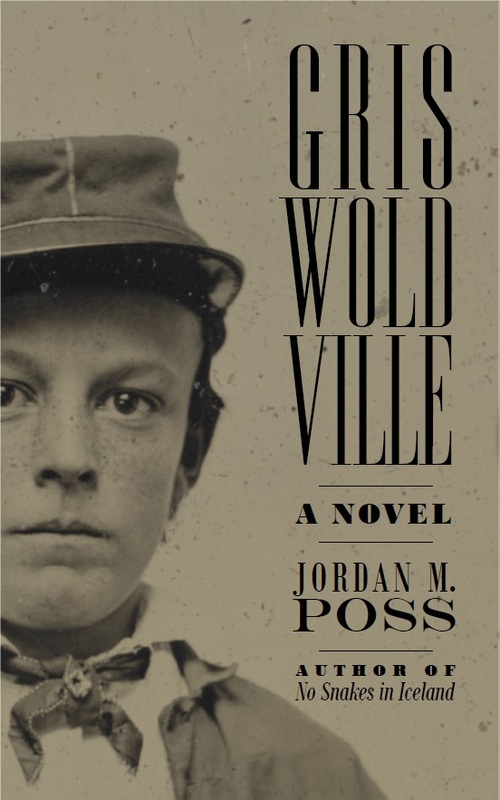 The voice, for me, was the giveaway. 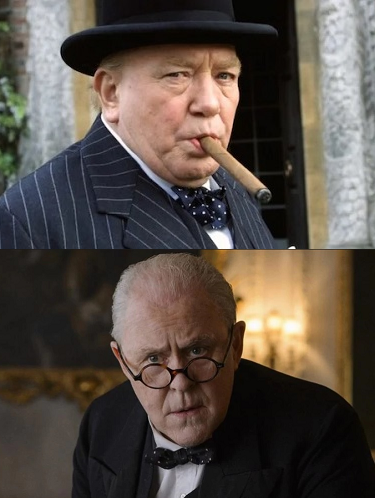 This is not to detract from Oldman's performance or the film—go see it—but Oldman will ultimately come up second or third in my favorite cinematic Churchills. Albert Finney's performance in The Gathering Storm is a longstanding classic, a handsome and well-acted TV movie that gives you a very good sense of Churchill out of power. This is Churchill during his "wilderness years," politically ostracized and barely making ends meet through his writing. Finney is excellent. The best sound-alike I've come across is certainly Timothy Spall in The King's Speech, where he has a small and not particularly accurate role in the abdication crisis. Into the Storm boasts one of my favorite actors, Brendan Gleeson, as Churchill, but Gleeson is too burly for Churchill and the film is a rather cheap-looking TV production. Michael Gambon, the second Dumbledore, was miscast in Churchill's Secret, which also missteps by devoting a lot of its time to a fictional nurse's personal struggles. I haven't seen last year's other Winston movie, Churchill, but I love Brian Cox and he apparently gave a solid performance in a film that was—speaking of character assassination earlier— otherwise garbage. To the surprise of no one more than myself, perhaps the best Churchill performance I've seen recently—vying with Finney's classic and the bold new Oldman—is John Lithgow in The Crown. Lithgow is too thin and tall—by eight inches—for Churchill, and he's American to boot. So what a wonderful surprise to see a nuanced, carefully balanced and real portrayal of Churchill. To me, Lithgow's unlikely Churchill perfectly blends the traits that make it easy to caricature the man in one direction or the other: the crankiness and amiability, the cold blooded determination and maudlin sentimentality, the confidence and bouts of depression, the devotion to honor and tradition and the political calculation, the high-flown grandiosity and candid self-deprecation. Churchill was both a frustrating man and one who inspired intense devotion. I haven't seen both sides of him portrayed quite as well. Winston's War: Churchill 1940-1945, by Max Hastings is a comprehensive look at Churchill's wartime leadership, including much, much more than the month covered by Darkest Hour, including Churchill's ill-fated courtship of American help (carefully and subtly portrayed in Darkest Hour), his obsession with commando operations and opening a front in the Mediterranean, and his eventual marginalization by Roosevelt in favor of Stalin and his fall from power. 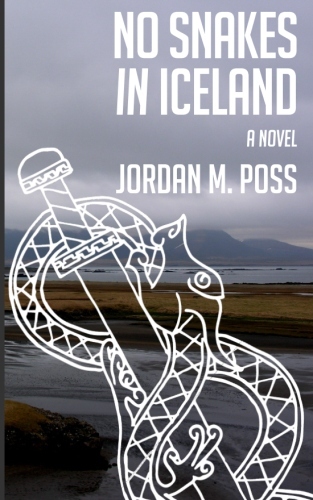 It's a triumphant and tragic story brilliantly told. I highly recommend it. The Duel: The Eighty-Day Struggle Between Churchill & Hitler, by John Lukacs, is a short, brisk history that frames May and June of 1940 as a battle between two titanic personalities at the height of their powers. Both Churchill and Hitler struggled with recalcitrant subordinates and military setbacks, and both traveled extensively back and forth between command centers and points of crisis as the invasion of France unfolded. Lukacs, with pointed insight, does an excellent job of laying out the parallels but also, more importantly, explaining the deep differences between the two men and their sides and foreshadowing the different courses Churchill's and Hitler's wars would take. As I watched Darkest Hour, I was reminded again and again of The Duel, and when I watched the end credits I realized why—Lukacs served as the film's historical advisor. Lukacs has also written Five Days in London: May 1940 and Blood, Toil, Tears and Sweat: The Dire Warning, Churchill's First Speech as Prime Minister, two short books on even narrower slivers of Churchill's early leadership: a few days during the collapse of the Allies in France and a single speech to parliament. Winston Churchill: A Life, by the late Sir John Keegan, is a short biography from the Penguin Lives series. Keegan manages to compress Churchill's massive life into a brisk 200 pages, with good attention given to his wartime years. I recommend this biography to anyone setting out to study Churchill for the first time. Blood, Toil, Tears and Sweat: The Great Speeches is a wonderful Penguin Classics collection of Churchill's oratory from across his long career, including the three immortal speeches dramatized in Darkest Hour. Finally, Dan Snow of the History Hit podcast has two excellent interviews on Darkest Hour available: one with Anthony McCarten, the film's screenwriter, and another with Gary Oldman himself, who is remarkably humble and candid about his approach to portraying Churchill. Each interview is around twenty minutes long, and well worth the time to listen. Go see Darkest Hour. It's a very good film and an excellent look at one month of history. Pair it with Dunkirk to get a sense of those events from the top down and the bottom up. And check out some of those other Churchill films. If you already have and have a favorite film version, let me know which it is with a comment. But above all, dig into the history and learn from it. It's something Churchill himself, no mean historian, would heartily endorse.